Saving seeds from heirloom or open-pollinated cucumber varieties is a wonderful way to ensure that you can keep growing your favorite varieties year after year. Even better, you can select seeds from those fruits with the best qualities, tailoring the variety to conditions in your own garden over the years. Saving cucumber seeds is not as straightforward as saving bean seeds, or even tomato seeds. Unlike beans and tomatoes, cucumber blossoms are not perfect -- they need to be pollinated by insects (or by the gardener) to set fruit. And, to complicate things further, cucumbers cross easily with other cucumber varieties. Professional seed savers recommend isolating cucumber varieties by 1/2 mile to prevent crossing. Since most of us do not have that type of space to work with, we have to handle isolation and pollination another way. The first step to take if you plan on saving seeds from your cucumbers is to isolate the plants you want to save seed from. You can bag individual female blossoms (these are the ones that look like they have a tiny cucumber at the base) before they open in spun polyester or cotton bags to prevent insects from pollinating them. Do the same with a male flower. 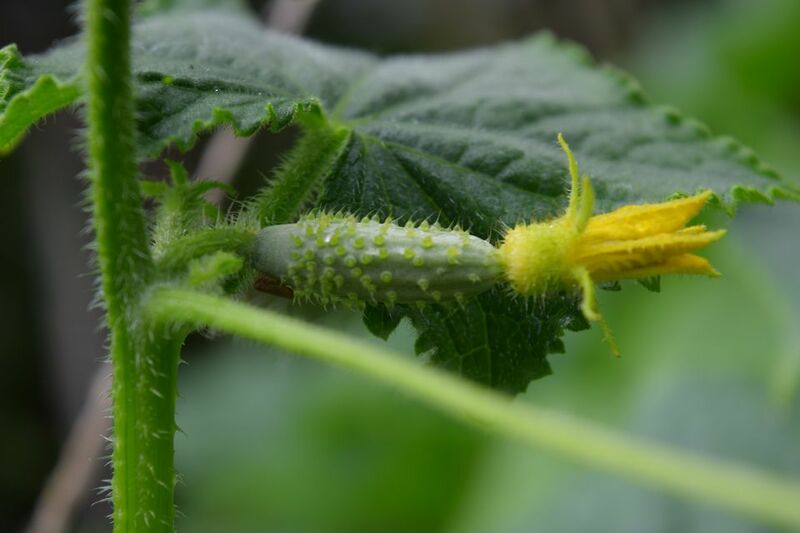 Then, tag the branch with that female blossom so you know later that this cucumber should be saved for the seeds. The other way to isolate your cucumbers is to build a cage that will enclose the entire plant or plants -- wood or PVC with spun polyester or screen over it will work. Since we can't allow those haphazard bees to pollinate the cucumbers, we have to take that task on ourselves. Use a small brush to dab some of the pollen from a male cucumber flower onto the stigma (center) of the female flower. Then bag the female blossom again, and let the waiting begin. Once fruit forms, you'll know that your hand-pollination worked. You can then remove the bag, but make sure you keep this fruit tagged or otherwise labeled so it doesn't end up in a salad by mistake. Cucumbers that you are growing to save seed from must be grown to full maturity, much past the point where they are no longer edible. The cucumber will be larger than usual harvest size and will start to soften. It will also change color from green to whitish. Harvest the fruits, then cut them in half lengthwise. Over a bowl, scoop out the seeds from the center of each half. Add about as much water to the bowl as the number of seeds, and set aside in a warm, sheltered spot to ferment, much as you would if you were saving tomato seeds. Fermentation of cucumber seeds can occur in as little as one to three days; once most of the seeds have sunk to the bottom of the container, they are finished fermenting. Add more water to the bowl at this point to clean your seeds. Debris and bad seeds will float to the top, where you can discard them easily. The good seeds will be at the bottom. Rinse them a few more times, then strain them out and place them on paper towels or uncoated paper plates to dry. Once they are completely dry, label your seeds and store them in a cool, dry place. Stored properly, cucumber seeds will remain viable for ten years. A refrigerator is an ideal place to store your seeds.